Ruth nodded, but she did not tell him that she had stopped dreaming that kind of dream a long time ago. Her job was to make a home for him wherever they went, to be a good housewife and hostess to whatever congregation they might have. She had left her comfortable home in the big city with reluctance and regret, and dreaded facing a new start in this strange and lonely district. Her severe, cold eyes appraised the countryside as they traveled through. The lands were good and the sheep seemed to be in good condition. But the snow-covered mountains frightened her, and she was worried about the fuel they would need for the winter; as well as the extra warm blankets and clothes that they would have to buy. Ruth stared at the small village nestling among the mountains and shivered with misgiving. She nodded once more, thinking that she must first find out about the living conditions and not get panicky just yet. Reverend de Kock drew up before the church. 'What a handsome church!' he exclaimed proudly. She looked at the parsonage situated on the other side of the church; she saw a dilapidated house, she saw half-ruined out-buildings, and she saw a neglected garden. Further down the road there was the market place surrounded by small, poor-looking houses and the hotel, which seemed to have been taken straight from an illustration found in a 'Wild West' book- all shabby, dusty and in need of a new coat of paint. 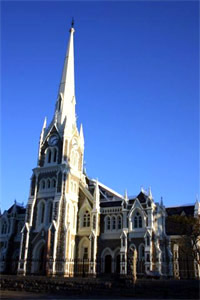 'Look at our church,' de Kock tried to get his wife to concentrate on the church. 'How solidly it was built! It needs a bit of repairing and redecorating but that's nothing. We'll do it in no time. The congregation welcomed the Reverend de Kock and his wife with warmth and joy. They had been without a minister for some time. His gentle reproach made Ruth angry. She began to knit furiously. 'Then they must try to keep us here,' Ruth said curtly. Johannes looked at her in surprise. De Kock's laugh was almost boyish. 'All you do is spend more and more time and money on this congregation,' she grumbled. Johannes kissed her forehead and was about to leave when he noticed how sad she was. With a pang of remorse he realized how often he took her presence for granted. He was not attentive enough to her. His work often meant too much for him. He must have neglected her many a time. He was her only concern. He was a selfish, ungrateful, conceited fool if he dared to think he was nearer to God than anybody else. 'Aren't you going out?' his wife asked. Reverend de Kock was a good preacher, a tactful and sociable minister, and above all, a very sincere man. Each Sunday his church was better attended, and even the most indifferent members of his congregation had to admit that he was a most exceptional pastor. It really was a wonderful sight to see all the people flocking to his church from the most distant parts of his parish on all possible occasions. De Kock welcomed them all to this house of God, preaching about the love and beauty of God, expressed in each tiny blade of grass and in the smallest of God's creatures. The somber down-to-earth faces of the people would light up and smile at him with real warmth. They liked him. They liked his sermons which did not threaten them with damnation and eternal fire, on the contrary, his words made them kindly disposed to one another. They wanted to show their appreciation. Never before had the church collections been so generous, de Kock was overwhelmed with gratitude. He commented on it to Ruth, who was as usual, cautious. Ruth looked away. She was getting into the habit of clenching her teeth. She looked rather ugly like that. The minister's suggestion was received with enthusiasm. De Kock had tears in his eyes when Jock de Villiers shouted to him outside the church. Jock de Villiers was slightly deaf and very rich. His words had weight. De Kock repeated the words of de Villiers to Ruth. She was furious. Johannes could not understand Ruth. How could she talk like that about the place, and the people he loved? He was so full of plans and new ideas. He was not in the state of mind to listen to her complaints, especially today, when his congregation had applauded his suggestion for the restoration of the church. The alterations had been completed. The church was cleaned, plastered and painted. Johannes spent hours supervising the work and was proud of the results. Ruth watched the operations with a feeling of jealousy, and kept pressing de Kock to do something about the house. Johannes promised to listen to her, but did nothing in this respect. He felt guilty towards her and began to avoid her. He tried, however, not to irritate her unnecessarily. He spent most of his time visiting the people, and to save their car he walked as much as possible. On his visits, he discovered that there were many inactive members in his parish. 'Then I will,' Ruth said calmly. 'You'll do nothing of the kind,' Johannes was angry, 'I forbid you, Ruth.' He stormed out. De Kock wrote to the Belville congregation the same day refusing the call, but a few days later one of the shopkeepers asked him politely (in the shop) whether he intended to leave Arendsfontein. At a meeting of the church committee, which was called urgently by the elders of the church, de Kock received another surprise. The notion of building a new parsonage was put to the vote. In spite of all his loyalty towards his wife, de Kock refused to accept the suggestion. 'Hear, hear,' shouted the others. They became enthusiastic and the more he tried to persuade them to drop the idea, the more they stuck to it. Johannes was overwhelmed with gratitude. He could not understand how it had happened, but there it was, God's answer to Ruth's prayers. The very sign that He wanted them to stay and be happy in Arendsfontein. Johannes felt very humble. Architects drew up the plans, the contractors made rough estimates for the approval of the Church Committee, and the district began to collect money in earnest. The house would cost a great deal of money. But the congregation did not mind the expense. The social functions followed each other in rapid succession. Bazaars, concerts, bring-and buy sales, all with one purpose; to collect more and more funds. The women competed in offering their best home-made produce, the men in giving generous donations. De Kock was naturally in the thick of it all, taking part in all these social functions and his days were crowded with meetings, discussions, speeches. Ruth was now the most charming hostess and helped her husband enormously to be the social success he was. The house was reality. As soon as sufficient funds had been collected, a start was made. De Kock and his wife were in constant consultation about this or that, and the members of the congregation were delighted to see their interest and satisfaction. Ruth had already discussed the interior decoration with the committee ladies, and had chosen furniture, carpets and even a few dignified pictures. Everything that she had ever dreamed of was coming true. More money was still needed and de Kock discussed the best way of raising it with the elders. De Kock was deeply moved and that Sunday he preached a sermon praising his congregation for their generosity towards the church. At each service, large sums of money were collected, and de Kock felt more and more indebted to those who contributed so lavishly towards the building of his house. Ruth made many friends and they were constantly invited to dinner parties and family gatherings. De Kock put on weight, behaved with more assurance and talked with dignity. Ruth was proud of her husband. When spring came in all her loveliness, the house was completed. It stood big and beautiful overshadowing the church and all the houses in the village. The sun streamed in through the big windows, lightening up the furniture and carpets; reflecting its light onto each cut-glass ornament. Everything was new, expensive and big. De Kock for the first time in his life took a pride in arranging his study, and gave suggestions to his wife over the arrangement of the furniture in the lounge. He praised her taste in her choice of curtains, she felt proud of him and felt he understood her better than ever before. The house-warming party was a great social success. Ruth was a charming, capable and grateful hostess. Everybody present congratulated de Kock on having such a brilliant wife. They were both so engrossed in the house that spring passed into summer before they realized it. Church attendance had dropped off considerably, but it was a time of year when the farmers kept busy and it did not worry de Kock unduly. Besides, he was busy himself; supervising the workers, laying out his garden, arranging his stamp collection, a hobby he had given up a long ago. Being so busy he visited the people in the district less and less, and every time he was away, he longed to be back in his house as soon as possible. He couldn't understand why himself. He tried to get rid of this new attachments and he talked movingly about the house which had been entrusted to his care, and which belonged to his congregation. He told the members of his congregation that they were welcome to his house whenever they wanted to see him, or to share his comforts. But in reality he began to enjoy his privacy as never before. Gradually the visits became more and more infrequent and de Kock and his wife were left to themselves. Johannes preached as usual on Sundays, but he had lost the feeling of sharing the thoughts and emotions of his congregation. Perhaps this was due to a listlessness that always seemed to affect the people in the hot summer months. Ruth, the practical one, was the first to notice that collections were becoming smaller and smaller. She said nothing for some time, but finally drew her husband's attention to it. He seemed unconcerned, but the next Sunday he preached a beautiful sermon on the happiness he had found in Arendsfontein. But, strangely enough, his congregation seemed quite unresponsive. He had lost all contact with them. Only then did de Kock realize how very small the attendance in the church had become. Only then did he notice how the people had lost their spontaneous friendliness towards him. He began to worry. The house seemed strangely silent and cold to him now. He lost interest in his stamps and in his garden. He no longer enjoyed his quiet evenings at home. He wanted the people, he wanted them all back. He did not know what to do, and for once his wife was of no help to him. But every Sunday there were more empty pews. Now he had noticed every absent face, and welcomed with joy each one present. He made a few attempts to restore their old relationship. He celebrated the centenary of the church with a big function but few people came. He invited them to his birthday party, and tried to appear a carefree and charming host, but it just did not work. He couldn't work or pray. 'Why do you worry so much, Johannes? They'll all come back when they need you. At the moment they moan and groan about the money they spent on us, and some of them talk with scorn of all the luxuries the Reverend de Kock enjoys. Such is human nature. But they'll forget about it slowly. 'What reason?' Johannes asked sharply. 'Your leaving, Arendsfontein, my darling.' Ruth said amused. Johannes looked at her with strange intensity. 'Oh, God!' Johannes exclaimed, and without another word to her, walked out. He stayed in his office until the early hours of the morning. When the dawn began to break, he came out. As de Kock walked towards the willow trees, the first red rays of the sun penetrated the early morning mist. Suddenly he felt an urge to pray. The feeling came so suddenly and was so strong that he knelt on the ground and raised his eyes to the sky. At the same time, the sun broke through the mist and shone through the branches of the trees, illuminating each separate leaf and twig. He continued to kneel, but had a strange and wonderful sensation that his spirit had left his body and he soared happily up and up, high in the vibrating air and he felt that he was in the great shining space that surrounded him and which embraced the trees, the lands, the mountains, the springs-everything that God had created. There was such a glorious beauty in everything he saw that he could only pray, 'Oh, God, please let me enjoy it and let it stay like this forever and ever.' The world seemed to acquire a greater and greater brightness and splendor. How long he remained in this state of ecstasy, he never remembered, but when he finally heard the birds singing and came down to earth again, he touched his face with his hands and felt it was wet with tears. God was good to him. He got up and walked away. He did not turn his head once in the direction of his house. He simply left it all behind him, and walked on. It was by sheer coincidence that Jock de Villiers and his friend, an Indian businessman returning from an agricultural conference in Durban, spotted de Kock on the road. He thought the man in front of his car, walking with an easy stride, thin and lanky, was a common tramp; and stopped to give him a lift. The man looked up, and Jock, in spite of the man's beard and long hair, recognized his former minister whom the people of Arendsfontein, including his wife, had given up for dead. But there he was with a look of great content on his face. He smiled at the men in the car and refused a lift. De Kock laughed happily, 'This is His house,' and he made a circle with his arm. 'He needs no other. Please don't spoil my happiness,' he walked away without another word.